Bivrost, the Northern Lights bridge has been known to connects the land of men with the land of the Gods in Old Norse myth. Few, however, known that others bridges and paths connect the remaining lands of the mythical Viking world. According to the Norse poem Grímnismál, the entirety of the world is actually centered on the axis of one rather peculiar item, a tree named Yggdrasill. The tree, which is also said to become the meeting-place of the Gods when Ragnarök engulfs the world with flames, has three main roots that connect the world. One root connects the humans to the tree, another one goes to the giant-lands and a third one creeps towards the kingdom Hel, the goddess of death. Yggdrasill’s three roots, despite being quite-logically gigantic, are under the constant attack of the evil snake Nidhöggr who constantly chews on them. Opposite to the snake, high up the in clouds where the highest branches of tree lie, a majestic eagle resides. The eagle (which is never named in the sources), harbors an extreme distaste for the snake that hurts his majestic wooden perch and thus spends most of his time hurling insults at it. To convey these “colorful” words to Niddöggr down below, he makes use of one the most unique mythological creature that is, Ratatoskr, a magical squirrel. This squirrel constantly runs up and down the world-tree to send insults to Nidhöögr, who promptly answers with hateful slander of his own. Near Nidhöggr’s poisonous fangs, one of the root of the world-tree makes its way to the kingdom of Hel, where the deceased who did not fall in battle reside after death. 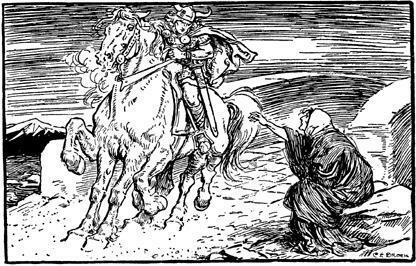 According to the Medieval Icelandic poet Snorri Sturluson, when the God Baldr was killed, his brother Hermóðr rode for nine nights and nine days to this dreary land. When he arrived there, he was met with a massive river that could only be crossed by walking over the fantastical bridge . The construction, almost like a Bivröst in reverse was guarded, this time by a female giant named Móðgugr, and was said to be covered and thatched with shimmering gold. As such, both the Northern Lights bridge Bivröst and its more ominous subterranean cousin, the Gjállabrú, as if they responded to each other, shimmer in the darkness, enlightening the world of old Norse Myths.